Oooh, ahhh! C'est magnifique! It's the Paris Skirt, a la a free tutorial at Nothing Too Fancy. The tutorial is based on measurements, so it would work for any size. Do you love it? I do! And it was simple to make too. Sure, there are easier skirt tutorials, but this one has a nice, flat front waistband and stylish pleats. Well, at least it did have multiple pleats before I had to take one out. Rora's fluffy diaper bum filled out the skirt a bit too much, haha. Best to err on the long side when skirting cloth-diapered little ones! But no matter, even with just one little pleat, it's super sweet on little miss, don't you agree? 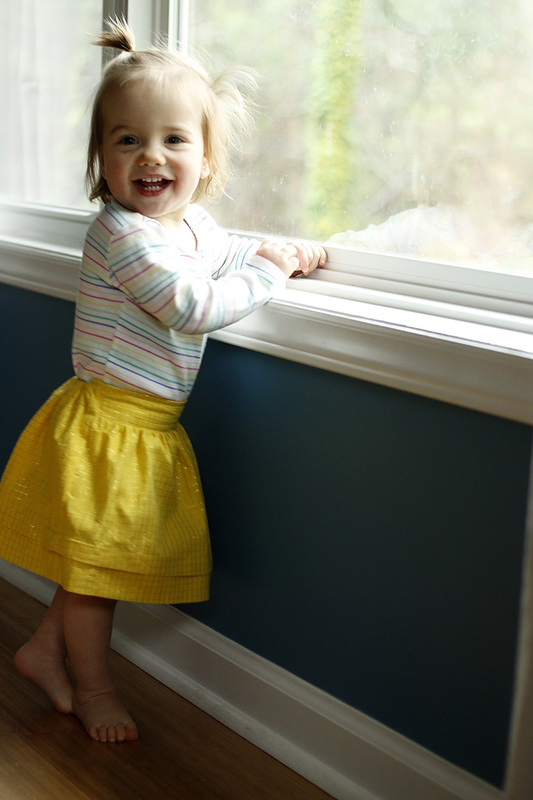 The skirt has elastic in the back waistband for a no-fuss fit and quick diaper changes. Our back waistband tends to roll a bit, I think because I used too-wide elastic. No worries. There will be a next time! If you're the least bit adventurous, I recommend giving the tutorial a spin. You can leave off the pleats (she even tells you how) to use less fabric. I ended up using about a 1/2 yard for this approximately 2T size skirt. Let me tell you about the fabric. This is Anna Maria Horner's Illimunated Graph print. The grid is created in shiny metallic thread. As a skirt, it'll coordinate with lots of tops, but still has some sparkle and pizazz. I already have plans for the other colors! Yep! The Confident Stitch has every color of Illuminated Graph while supplies last. Now, doesn't that feel better? Here's wishing us all sunshine this week!